Daughter. Wife. Mother. Employee. Friend. Volunteer. Pick out which ever title you like... any one of them can be a full time job in itself. Now, add Multiple Sclerosis Patient to that list and we have another ball of wax all together! I am all of those things and so very much more. 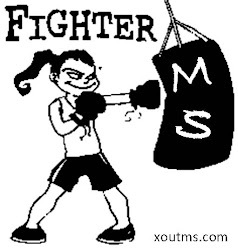 I started this blog - not only as a part of my fundraising updates to friends and family, but as a journal of my life with MS. A place to share my struggles and triumphs with others. I haven’t posted in quite a while… that seems to be a consistent beginning to posts for me lately – doesn’t it! :-/ Sorry about that. A LOT going on right now. I wanted to label this post as ‘brain vomit’ – but I figured that wouldn’t be very appealing – so I’m leaving it untitled for now. Back in July – I posted about having to stop the oral treatment I was on because it decided to wage war on my liver (big bummer) and that I’d have to start another treatment. Well – I can expound a little bit about that now. The last treatment option for me (that is FDA approved for Multiple Sclerosis) is Tysabri. That would be the medication that was pulled from the market for a time when I was first diagnosed around 2005 because of deaths related to PML – a rare & untreatable brain infection. This drug has returned to the market after more research & I’ll try to sum it up in a nutshell… The researchers discovered that there is a virus – the JC Virus – that is the precursor to PML… Normally – on its own, JC Virus doesn’t really do anything to you however if you have the JC Virus – your chances of developing PML while taking Tysabri is much MUCH higher than if you don’t. (Just like MS, no one knows how one contracts the JC Virus). That said – the researchers developed a blood test that can check to see if a patient has the JC Virus or not. A good step in the right direction and should remove some of the risk associated with Tysabri treatments, right? So – I requested to find out how to get tested for the JC Virus before I started on this new treatment. It took quite a long time – but I got the results to that blood test yesterday. Guess what? I tested positive. DANG IT! I’d be lying if I said I remembered much else of the visit after that… my husband tells me that the two of them discussed exactly what this meant & how the chances of getting PML during the first 12 doses is negligible at best… yada yada yada. As we were leaving the appointment, he walked me to the infusion center & we scheduled the first dose for next Wednesday – Oct. 5th. · So - I haven't yet started Tysabri - but I'd be lying if I said I wasn't scared to do so. · I'm told (by my medical team) that it's my last 'on-label' drug option. I have the neutralizing antibody to interferons - so the rebif, avonex, betasaron drugs are basically saline solution once injected into my system. I'm told that copaxone isn't a good option for me (which is good since I don't think I could do the daily injections and be consistent with it). I've tried the new oral medication (Gilenya) and was kicked off that in less than 3 months because it put me at near liver failure stages... I've even done a medical trial for 'BG-12' and continued to relapse on that and was removed from that trial. · I think I'm becoming resigned to it - but that's not exactly how I want to be when entering into a new treatment option.